Thank you so much for educating me about Bluebirds. 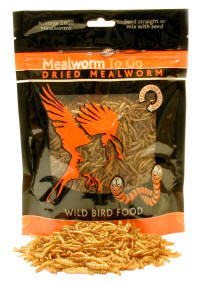 I bought several bags of dried meal worms and put them in my feeder. Mama Bluebird found them right away and is feeding them to her three baby Bluebirds (yum!). I am sure she is very grateful to WBU! What a great Picture! The mealworms that she is feeding are an easy substitute for the live mealworms that many people feed their bluebirds. The dried variety are reliably available; whereas, the live mealworms may be difficult to acquire during the heat of the summer.